Spring has (almost) sprung, and you know what that means! Time to update our wardrobes (or pull out those pieces we’d packed away for the colder months). Of course, florals are the typical go-to for spring, but I’m challenging you (& myself!) to find and wear unconventional florals this season. I went to an Easter Brunch on Friday, thanks to Fashion Mamas & Merci Bisous, and wore this gorgeous dark floral maxi dress by Aussie brand Nicholas. In a dark, yet vivid floral print, in crinkled silk crepe fabric, this extremely romantic dress was the perfect unconventional spring floral. The delicate lace at the neckline and in between each seam of the tiered skirt add to the romantic feel. To give the dress a bit more edge, I paired it with a white leather moto jacket and a pair of flat ankle boots. Need some inspiration? 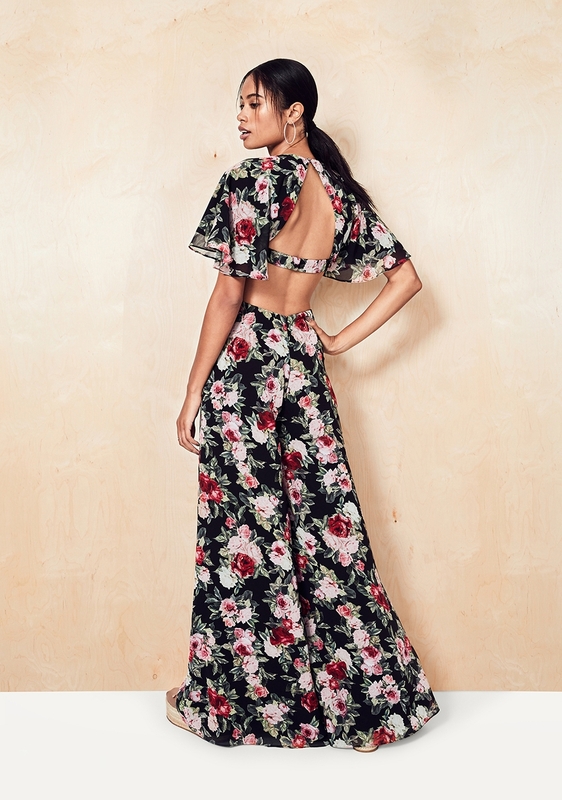 Below are some unconventional floral and tropical print pieces perfect for spring. This beautifully vibrant palm printed top & bottom from MissGuided would be a perfect addition to your Spring/Summer wardrobe You can wear the pieces together or separately, opting for a simple white tee with the pants or go a little more bold and add some stripes! This gorgeous mustard colored dress with gathered v-neck and flounced sleeves is definitely unconventional, with its muted grey florals. Available at Mango. Add flounce, cutouts and an open back to any piece, and I'm sold. This Fame and Partners jumpsuit is no exception! Of course, this post wouldn't be complete without a dress from ASOS. This dark beauty had me at asymmetrical hemline and single bare shoulder. So... what will you be wearing this spring? Let me know in the comments!